Having played on the Tour with the Original Prince Graphite (and before that the Prince Woodie), it's always fun to try out any Prince OS racquet. The Prince 03 Blue was no exception. With a power level of 1300 combined with a length of 27.5 inches, I was expecting to have lots of trouble controlling my groundstrokes. I couldn't believe how effortless it was to play with power and accuracy with the Prince 03 Blue. I hit the ball so well that I thought I was just having "one of those days" where it wouldn't matter what racquet I played with -- I'd still hit the ball great. After playing three hours in the morning, just to make sure the racquet was as good as the first impression it made, I played with it again in the afternoon. I was able to hit with power and control; I could generate enormous spin with tremendous racquet head speed; I had no problem hitting vicious angles; I was able to hit with great power when stretched out really wide, and I loved the forgiving feel of this racquet when I hit off-center shots. The only slight problem I had was with the backhand slice. I felt the racquet increased the range of my shot by a couple of metres, which meant that a number of my slices landed beyond the baseline, even though I felt I'd hit them perfectly. Just as with the groundstrokes, I felt totally comfortable at the the net. I got plenty of power out of the racquet. I found that with anything high, I may as well have caught the ball and said "my point", it was that easy to direct balls into the corner with pace. Due to the lightness of the racquet, there was absolutely no difficulty handling either low volleys or hard balls hit by my opponent. The Prince 03 Blue is a very agile racquet that feels easily stable enough to handle heavy balls that come at you fast. I was also pleasantly surprised by how much feel I had for touch shots off difficult balls. After only a couple of smashes, it felt as though I could do whatever I wanted with the ball. 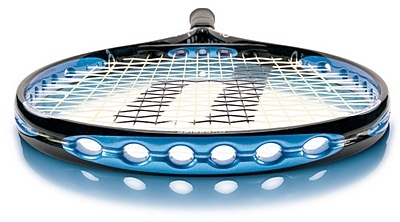 Huge pace and plenty of control makes the Prince 03 Blue a beautiful racquet to smash with. As for the serve, I usually find that I tend to find the net more often than I'd like when I try out an oversize racquet. This wasn't the case with the 03 Blue. I suspect because the 27.5 inch length gives a little higher contact point. I found flat, slice and kick serves were a breeze. The racquet head speed and the racquet's power combine to make this a really decent serving racquet, unlike some of the oversize frames that I've tried. I found the racquet equally well suited to blocking back hard serves, really going after weak second serves, and an agile raquet for "chipping and charging." I guess by now, like me, you've concluded I really like this racquet. So much so I'm thinking of changing to it. I'm going to wait, though, until I've tried all the 03's and the Hybrids before making a decision. My recommendation is that anybody (except juniors still in the development phase of their games) should give this racquet a try. I would not recommend it to juniors as it's such a comfortable racquet to play with, I'd be concerned young players could become a little "lazy" when they play, which would limit skill development. But for anybody else, get out there and have some fun with this one. Be sure to subscribe to "Tennis Experts Specials And Alerts" newsletter to be the first to know what new tennis equipment has been released by the major international tennis manufacturers like Prince, Head, Yonex, Wilson, Dunlop and Gamma. You will also receive a special code word that will entitle you, for a limited time, to a 10% discount at Tennis-Experts, the online tennis equipment specialists.